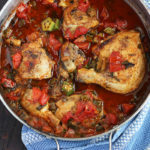 Tasty bone-in chicken thighs are roasted in a rich sauce of sliced okra and tomatoes with fresh herbs. Perfect way to use up a late summer garden bounty. My summer garden is looking pretty pitiful these days. Where bounty once thrived just a month ago has finally given away to a few mealy tomatoes. Time to clean out those beds and plan for fall. Except for the okra. The okra takes a licking and keeps on ticking. Which has me searching for creative ways to incorporate it into my recipes. Luckily, okra doesn’t have a very overpowering flavor. It has been fairly easy to chop up a few handfuls to add to a soup or savory sauce. Okra is gaining popularity as the next superfood. It’s high in vitamins and minerals such as potassium, vitamin B, vitamin C, folic acid, and calcium. Okra is also low in calories high in fiber. Okra may also help manage blood sugar in individuals with Type 1, Type 2, and gestational diabetes. But what about that slime? 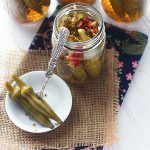 Anyone who has cooked with okra is well acquainted with the sticky juice that oozes from the pods once it’s cut into. The juice helps the pods retain water during the heat of the day. It’s also a natural thickener, which is sometimes desired in recipes like gumbo. But if not prepared right, it can also leave your recipe looking a little, well … snotty. Cooking okra at high heat thins out the element in the okra juice that produce that undesirable “snotty” texture. Adding a little acid to the dish, like in tomatoes, helps too. If you are one of those people who religiously chooses boneless, skinless chicken breasts because it’s healthy, you have been missing out on a whole lot of flavor, my friend. Chicken thighs are also an excellent source of lean protein. Remove the skin and chicken thighs contain only about 30 extra calories that chicken breasts. We’re leaving the skin on in this recipe. Because crispy skin makes me swoon and a little melted fat in the tomato sauce gives it a luxurious richness. I used a combination of chicken quarters and thighs because that’s what I had on hand. Chicken quarters simply have the leg and thigh still attached. Before you get started, go ahead and season your chicken on all sides with salt and pepper. 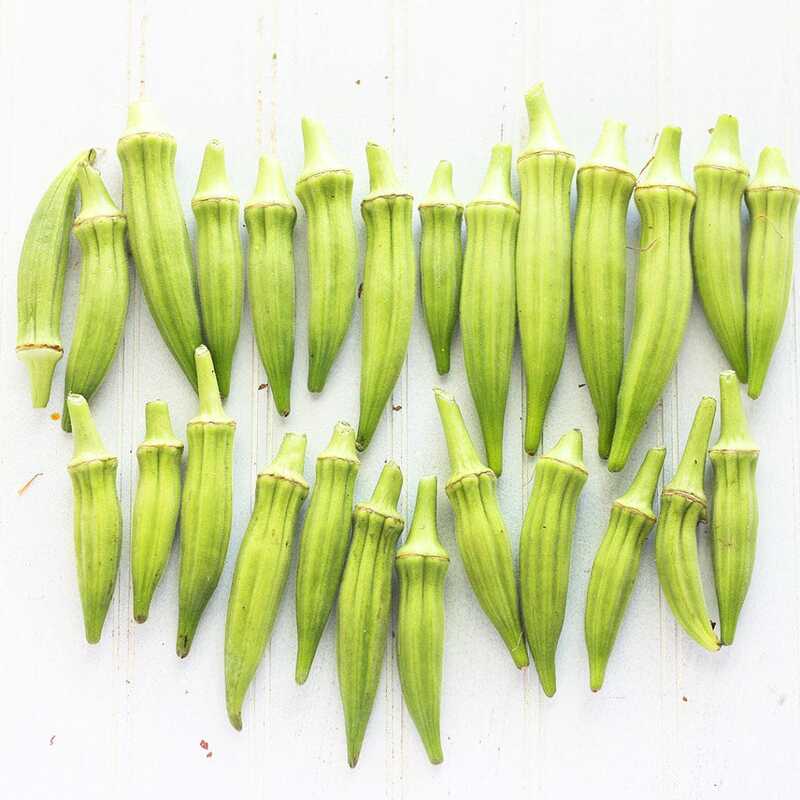 If using fresh okra, go ahead and slice it up into 1/4 -inch medallions and set aside. The recipe also calls for four fresh tomatoes, diced. One 15-oz. can of diced tomatoes can be substituted here. Step one. You want to preheat your oven to 350 degrees. Step two. Heat a couple tablespoons of olive oil in a large oven proof skillet over medium high heat. Once the oil is hot, start browning your chicken pieces. Place it skin side down at first. You may need to do this in batches to avoid overcrowding the pan. You want the skin touching the hot skillet so it can crisp up. The skin should be perfectly browned after about 5-7 minutes. 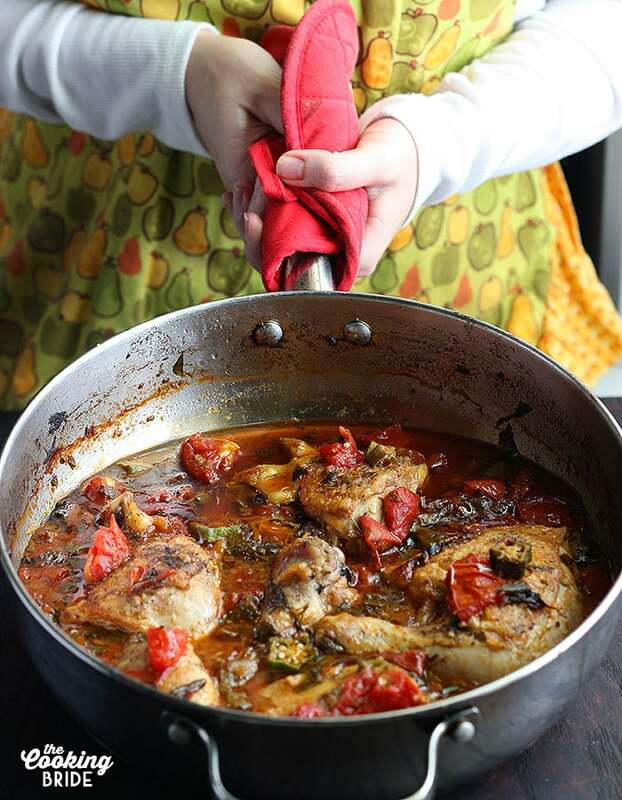 Remove the chicken from the skillet and set aside, but don’t drain the pan. Step three. Add the okra to the pan. If using frozen okra, don’t even bother thawing it. But be careful because water droplets from the frozen okra can cause the hot oil to pop. Sauté until browned on all sides, the okra until tender, about five minutes. Add some minced garlic cook for about 30 seconds. This is just long enough to get rid of that spicy bite that raw garlic has and allow it to impart it’s yummy flavor into the dish. Step four. Add some chicken broth and tomato paste to the pan. The tomato paste will give the sauce a more concentrated flavor. Whisk the tomato paste into the chicken broth until it is completely dissolved. Step five. Add the diced tomatoes and herbs. Bring to a simmer and cook for 2 to 3 minutes. Taste the sauce and season with salt and pepper to your preference. Step six. Spread tomato sauce into the bottom of a 9 x 13 x 2-inch baking dish. Nestle the chicken thighs in the sauce. Bake for 40-45 minutes or until the meat’s internal temperature reaches 170 degrees. A good quality meat thermometer can help with this. Once you pull the chicken out of the oven, allow it to rest for 10-15 minutes before serving. As the chicken roasts, all the juices rise to the surface. If you cut into the chicken right when it comes out of the oven, all those juices will run out. Letting the meat rest allow the juices to slowly redistribute back into the meat. Juicy chicken = success! Right before serving, drizzle the tomato sauce over the top. Add the okra to the pan and sauté about five minutes. Add garlic and sauté until fragrant, about 30 seconds to one minute. Add the chicken broth and the tomato paste to the pan. Stir tomato paste is completely dissolved. Add the tomatoes and herbs cook for 2 to 3 minutes. Season sauce with salt and pepper. 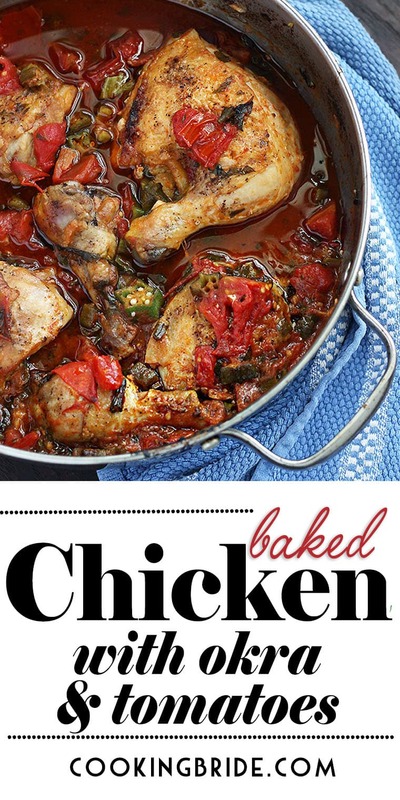 I love baked chicken! Looks so delicious and comforting – such a great idea for dinner! Yum! I’m always up for chicken thighs, and okra is a vegetable that I’ve never used. I need to add this to my winter recipes. Just pinned! Thanks for sharing! THIGHS are where it is at! For sure. Also, this dish looks so hearty and delicious. I really do love well cooked okra, but you are spot on about the slime. Yum! If that’s not southern comfort food, I don’t know what is! 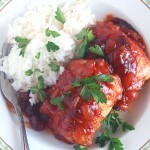 I love the use of chicken thighs- so much more moisture. 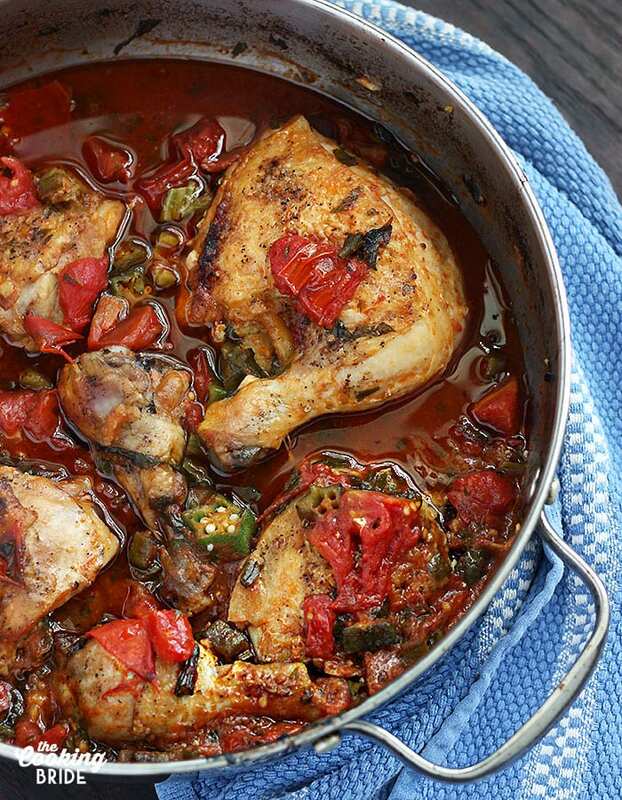 This is one good looking chicken dish! Chicken is always a good dinner choice in my opinion! I cannot wait to try this out!